Office water coolers will of course quickly tire of talk of Dom Sheed’s glorious match winner. The sublime coast-to-coast lead-up to Sheed’s clincher – headlined by Jeremy McGovern and Liam Ryan screamers – will likewise be etched in our memories. The fact of Luke Shuey’s Norm Smith Medal will endure, not least because you know it will be the subject of a quiz question in years to come. We’ll remember Collingwood’s blistering start and the rising fear of a grand final whitewash that accompanied it. West Coast’s resilience – surely borne in large part from the harrowing experience of its 2015 Grand Final train wreck – in withstanding not only the Magpies’ brutal opening salvo, but also their apparent early last quarter KO, is sure to live on. 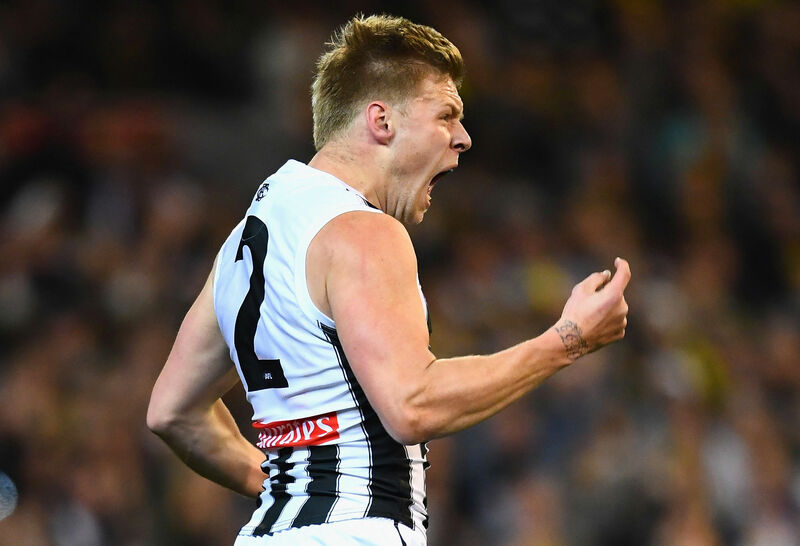 We may even recall Jordan De Goey’s three goals because it’s hard to forget goals like those. And yet so many more gripping ‘in the moment’ details about this most remarkable footballing contest will inevitably recede from memory. That such forgetfulness will not in any way threaten this Grand Final’s place in footballing lore is testament to what was a sporting masterpiece. The warmly celebrated opening goal from – Collingwood’s 2011 grand final tormentor turned black and white treasure – Travis Varcoe was the latest chapter in his inspirational finals story following the tragic loss of his sister. After Jack Darling’s third quarter resurgence had all but banished the demons of his dropped chest mark in the 2015 decider, he unthinkably spills the sealing mark in the dying moments. While the end result will mean this will likely fade from view for the rest of us, you can bet there is a big man in Perth who will occasionally wake up in a cold sweat plagued by thoughts of what might not have been. In between there was Lewis Jetta, the speedy kid from the Swans’ 2012 grand final triumph now all grown up. Having marked outside 50 with his rattled Eagles facing a near fatal 29-point first quarter deficit, Jetta had the presence of mind to pause. Cradling the ball in his left hand, Jetta coolly used his right to make a “let’s settle it down” patting motion before summoning his big forwards back to goal. The result was West Coast’s first major and the Eagles suddenly awakening from their early slumber. His influence didn’t end there. For it was Jetta who wrapped a consoling arm around forlorn Liam Ryan after the latter’s “he’d like to have his time over” third quarter dropped mark, a gesture which surely helped enable Ryan’s late game heroics. Then there was Mason Cox, the American in Jolimont. His late blooming grand final performance was symbolic of his fledgling football career and boding so well for his future. Cox’s affable personality, coupled with a footballing detachment that could only be possessed by a foreigner, a fantastic foil for his maniacal club in the lead-up to the big day. The journeymen played their part in the drama. An oftentimes tortuous seven years removed from a bad hip and a missed Cats’ premiership, Nathan Vardy finally had his medal. It wasn’t Chris Mayne’s fault the Pies handed him an inflated contract, and his Herculean 14-tackle effort meant it certainly wasn’t his fault the Pies lost on Saturday. And now we bask in grand final afterglow, accompanied by our memories of a marvellous decider. Some will stay, and others that don’t deserve to will drift away. For it was that type of football game, a true spring classic.